The Cynefin Centre for Applied Complexity is a transdisciplinary research and development hub which pioneers the application of complexity science to public policy, social issues and academic research. The Cynefin Centre exists to inform change; to orchestrate a paradigm shift that can radically transform the way we approach intractable issues within the world. By applying the principles of complexity science, the centre believes we can increase citizen engagement, provide a novel approach to policy and governance, and ultimately create new perspectives and ways of acting, not just in the UK but across the globe. The Cynefin Centre will act as Complexity Science partner to disaster futures, working with us to develop a model of sense making geared towards disaster and crisis related issues. 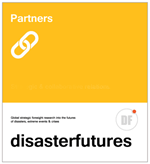 Making use of a highly participatory distributed ethnographic method called SenseMaker®, the partnership will specifically explore the role of human-sensor networks and how crowd-sourced perceptions can contribute to disaster relief. The centre is open to discussing collaborations with other interested parties.